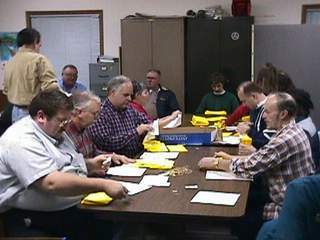 Following a brief business meeting, the main activity at the February meeting was the "tabbing", labeling and sorting of 5,000 hamfest flyers. Club members completed the task in "almost record" time by preparing all 5,000 flyer in about one hour!! Thanks to all who attended the meeting and helped promote the upcoming Hamfest 2000 on April 8!! 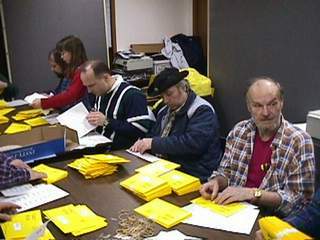 Club members putting address labels on 5,000 hamfest flyers. Stew WØSHL, Jeremiah KBØOFF and Steve KBØPSS operating an "assembly line" to place tabs on the hamfest flyers. (Notice that one person is working while the other two are watching!!). 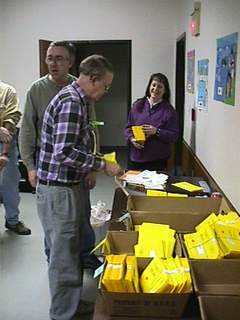 Bill, WBØYEE, trying to maintain order for the zip code sorting of the 5,000 labeled flyers. Peggy, KCØGNE, looks on.